This is another adaptation of a Sunday Brunch recipe which I felt need a bit more flavour and a few more veggies! It’s a lovely quick and simple curry but the tamarind gives it a really nice, different flavour. 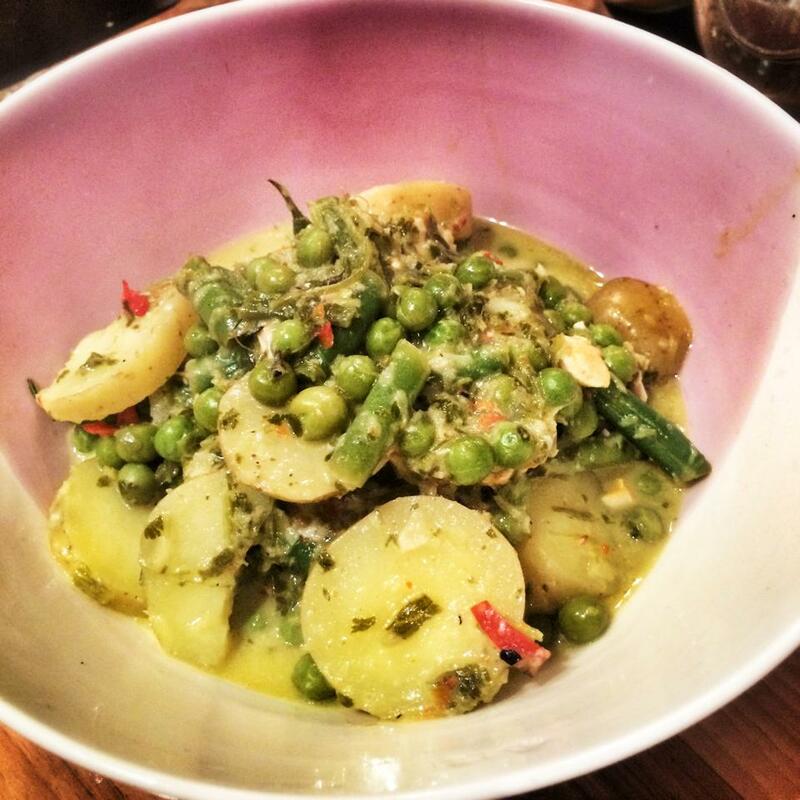 I’ve included a decent portion of potatoes in this recipe and so wouldn’t serve it with rice. If you wanted to add rice too, don’t forget to add the points. If you omit potatoes in favour of rice, the sauce would be 10sp per person. That may seem slightly high for a sauce but the mixture of salmon and coconut milk is packed with goodness and really worth it! Pop your potatoes on the boil until almost cooked through (around 6-7 minutes). Then begin the curry by making the paste. Blend all ingredients until smooth (you may need to add a little water). Pop 1tsp oil in a large pan and once hot, add the paste then cook on a low heat for a few minutes. Next, add the coconut milk, tamarind, ground coriander, sugar and crushed chillies and stir well. Add a little water if you need to to make the curry nice and saucey, mine didn’t need much. Next season the fish and rub in the turmeric. Pop the fish in the sauce the peas, green beans, spinach and potatoes. Cover and cook for 5-7 minutes until the salmon has cooked through. Finish with a twist of black pepper and squeeze in the juice of half a lime.